This tutorial was written by Jenny on 6-30-2009. Resemblance to any other tutorial is purely coincidental and unintentional. I am using the artwork of Lacy Clagg. You need a license to use her artwork. I am licensed to this image through LCTS. Open Template 41, close the copyright layer and words layer. Select circle layer with magic wand, copy & paste Paper01 as a new layer, selections,invert,delete,select none,hide original layer. On the dotted circle layer, select change to target brush and color them with a red from the kit. Select rectangle layer with magic wand, copy & paste Paper05 as a new layer, selections,invert,delete, select none, hide original layer. Select Star fill with magic wand, copy & paste photo, resize if needed,selections,invert,delete on photo layer, select none, hide original layer. Add a subtle drop shadow to the frame. Copy & Paste tubes, resize if needed, place to your liking, add drop shadow. Add copyright info and text and you are done. This tutorial was written by Jenny on 6-30-2009. Resemblance to any other tutorial is purely coincidental and unintentional. 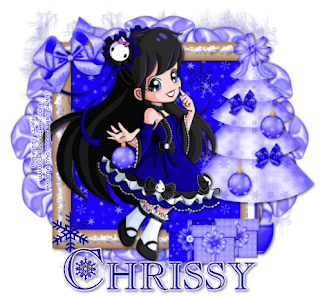 I am using the artwork of Chrissy Clark. I have a license through Artistic Minds Inc.
Open a new canvas 600 x 600. Flood fill white. New raster layer, flood fill with a color from the kit, apply mask, duplicate. Copy & Paste Frame5 as a new layer, resize 60%, move toward bottom. Copy & Paste paper of choice, resize 75%, use the selection tool to remove excess paper sticking out from the frame. Copy & Paste tube of choice, place below frame, resize if needed, dulpicate, mirror. Copy & Paste Bell as a new layer, resize to your liking and place in the middle frame. Copy & Paste Wrap1 as a new layer, mirror, place at the bottom of the frame, resize 60%, add drop shadow. Copy & Paste Pointsetta of choice as a new layer, place at the bottom left of the frame, resize to your liking,add drop shadow, duplicate and resize again by 75%, see my tag for placement. Copy & Paste pinecone as a new layer, resize 50%, add drop shadow, place at the top right corner of the frame. Copy & Paste tree, resize 65%, add drop shadow, place below frame layer so that it looks as though it's sitting on top the frame. Copy & Paste Bear1 as a new layer, resize 50%, add drop shadow, place infront of the tree. Copy & Paste tube of choice, resize if needed, add drop shadow, place ontop the frame. Copy & Paste snowman, resize to your liking,add drop shadow and place behind the tube. See my tag for further placement details. Add drop shadow to the frame and the two tubes below the frame. Add copyright info and text and you're done. This tutorial was written by Jenny on 6-30-2009. Resemblance to any other tutorial is purely coincidental and unintentional. I am using the artwork of Suzanne Woolcott. You can purchase her tubes HERE. Open Template. Select background with the magic wand, copy & paste Paper16 as a new layer, resize 75%, selections,invert,delete,select none,hide original layer. Select the Dark Grey layer with your magic wand. Copy & Paste Paper2 as a new layer, resize 75%, selections,invert,delete,select none, hide original layer. Add a drop shadow to the wordart layer. Select snowflake layer, selections, select all, float,defloat,new layer, flood fill white, select none, hide original layer. With the white layer selected, effects, plugins, dsb flux bright noise 47. Select frame with magic wand, selections,modify, smooth, copy & paste paper of choice, resize 50%, selections,invert,delete, select none, hide original frame. Repeat this step for each of the frames. Select with magic wand, copy & paste image of choice, resize, selections,invert,delete, select none, hide original layer. Repeat this step for each of the frame backgrounds. Add copyright info and text. Image, Add Borders, 2 and select color of choice, you're done. This tutorial was written by Jenny on 6-27-2009. Resemblance to any other tutorial is purely coincidental and unintentional. I am using the artwork of Lacy Clagg. You need a license to use her artwork. I am licensed to this image through LCTS. Open a new canvas 650 x 650 and flood fill white. New raster layer, copy & paste Paper5 into selection, select none, apply mask. Copy & Paste tent of choice, add drop shadow and place to the left of the canvas. Copy & Paste grassclump as a new layer, place to the left of the tent, duplicate and slide over just a bit, duplicate again and move to the right side of the tent. Then add any flowers you want and place them within the grass. Copy & Paste tubes, resize and place to your liking, add drop shadow. Copy & Paste leaf3 as a new layer, resize to your liking ,duplicate several times and spread out over the canvas. Copy & Paste lantern of choice, resize 50% (more if needed), add drop shadow, place to your liking. Copy & Paste firepit as a new layer, resize 65%, mirror, see my tag for placement. Open burntmarsh, rotate clockwise 90, resize 50% twice, place on fire pit, mirror. Copy & Paste tree of choice and place to the right of the tent, add drop shadow, duplicate, resize 85%, back on the first layer, duplicate and move over to the right. Copy & Paste tree01 as a new layer, resize 85%, place below all tree layers, duplicate, mirror, use the eraser tool to remove the pieces of these two trees that are in the middle of the others. See my tag. Copy & Paste moon, resize if you'd like, place below tree layers and toward the top. Resize or crop the canvas to your liking. Add copyright info and text and you're done. This tutorial was written by Jenny on 6-27-2009. Resemblance to any other tutorial is purely coincidental and unintentional. I am using the photography of JennyZ DreamZ (ME :) ). You need a license to use these images. If you are interested in licensing my photography for sig tag usage please contact me at the email address to the right. This is a pretty simple tut. You know I like to keep them that way if possible. Open a new canvas 550 x 450 and flood fill white. New raster layer, select with magic wand, copy & paste Paper3 into selection, select none, apply mask. Copy & Paste Frame1 as a new layer, resize 50%, move toward the bottom of the right side, duplicate, mirror and move upward a bit. Copy & Paste photo as a new layer, resize to your liking and place below the first frame, use the selection tool to remove any excess sticking out, add a drop shadow to the frame and merge only that frame with that photo, repeat with the other frame. Copy & Paste Awareness License Plate as a new layer, place to the left bottom of the canvas, resize 50% then again 75%, add drop shadow. Copy & Paste vine as a new layer, add drop shadow and place between the 2 framed photos. Copy & Paste Ivy as a new layer, place below the vine layer, add drop shadow. Copy & Paste charm as a new layer, resize to your liking and place on top of the vine. This tutorial was written by Jenny on 6-27-2009. Resemblance to any other tutorial is purely coincidental and unintentional. I am using the Photography of Karron Cobb Weiss. I am licensed to these photos through Artistic Minds Inc. 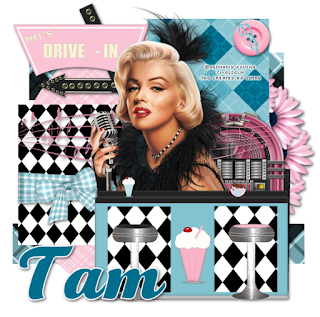 Please check her site above for more licensing info..
New Raster layer, select with magic wand, copy & paste Paper8 into selection, select none, apply mask. Copy & Paste Element7 as a new layer, resize 60%, add drop shadow. Copy & Paste Element35 as a new layer, resize 70%, pulling it over to the right a little, add drop shadow. Copy & Paste Element32 as a new layer, resize 60%, add drop shadow, pull over to the left a little, and place atop the fence layer (element35). Open Element38, rotate clockwise 90, copy & paste onto canvas, resize 60%, add drop shadow, place toward the top, see my tag. Copy & Paste photo of choice, resize and place below the frame, hide all layers except the frame and photo and merge those two together, unhide all others. Repeat the above step, then free rotate it 25 degrees left. Copy & Paste Element46 as a new layer, resize 50% then again by 45%, add drop shadow and see my tag for placement. Copy & Paste Element54 as a new layer, resize to your liking and place on the rotated frame. This tutorial was written by Jenny on 6-26-2009. Resemblance to any other tutorial is purely coincidental and unintentional. I am using the artwork of CEI/IBIS Studios. I have a license from MyPSPTubes. Please check the site link above for more licensing info. 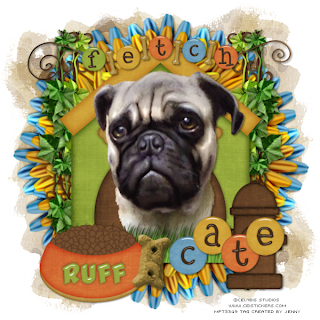 This tutorial is dedicated to my daughter Cate and her lovely Pug Dog Sandy, may she rest in Peace. Sandy was Cate's pet at her fathers house and she passed away last month, unexpectedly. It was so heartbreaking for her and the entire family. I love you Cate and I'm so sorry Sandy passed away :( I know this isn't a typical R.I.P. type of tag but when I saw this kit and then ran across the tube at MPT I thought it would be a great way to honor Cate's memory of Sandy. Open a new canvas 600 x 600 and flood fill white. New Raster Layer, select all, copy & paste Paper2 into selection, select none, apply mask. Copy & Paste Daisy3 as a new layer, resize 75%, add drop shadow, effects, plugins,MuRa's Meister Copies Encircle (default settings). Copy & Paste Daisy1 repeat step above, resize 90%. Copy & Paste Kennel1 as a new layer, resize 75%, add drop shadow. Copy & Paste tube of choice, resize to liking and place in or next to the Kennel. Copy & Paste Grass, resize to fit at the bottom of the Kennel, add drop shadow. Copy & Paste food bowl of choice, resize 65%, add drop shadow, place to the left. Copy & Paste Dog Biscuit of choice, resize to your liking, add drop shadow and place next to bowl. Copy & Paste fire hydrant as a new layer, resize 65%, add drop shadow, place to the right. Copy & Paste Vine2 as a new layer, resize 85%, place below Kennel, add drop shadow, duplicate, mirror. Copy & Paste anothe vine of choice, repeat. Copy & Paste wordart as a new layer, resize to your liking and place at the top of your canvas. Merge visible. Resize if you'd like. Add copyright info and text and you're done. I used the alpha which is included in the kit. This tutorial was written by Jenny on 6-23-2009. Resemblance to any other tutorial is purely coincidental and unintentional. 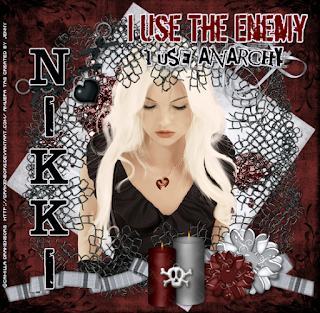 I am using the artwork of Angela Newman. You need a license to use her artwork. I am licensed through Artistic Minds Inc. Please check her site for more licensing info. Open a new canvas 600 x 600 and flood fill white. You can resize later (although I think it looks better larger) lol. New Raster layer, select with magic wand, copy & paste Paper16 into selection, select none, apply mask. Copy & Paste heart ribbon3 as a new layer, add drop shadow. Copy & Paste Lace Doodle as a new layer, add drop shadow, duplicate,mirror. Copy & Paste Frame2 as a new layer, resize 60%. Copy & Paste Paper6 as a new layer, resize 50%,move below frame, use selection tool or eraser to remove any excess. Copy & Paste Tube as a new layer, resize if needed, place above Paper6 layer, if you want the head to stick out from the frame then select the portion with your selection tool, right click, promote selection to layer, move to the top, select none, add a drop shadow to the frame and to the original tube layer. Copy & Paste bead wire2 as a new layer, add drop shadow, move below frame and tube layer. Copy & Paste Ribbon Bow 1 as a new layer, resize 85%, add drop shadow and place on the frame toward the bottom. Copy & Paste flowers of choice as a new layer, resize to your liking and place at the top corner of each side of the frame. Copy & Paste necklace as a new layer, resize 80%. Copy & Paste teddy bear as a new layer, resize to your liking, see my tag for placement. Now using your eraser tool, erase the parts of the chain that cover the ribbon bow and teddy bear. See my tag. Copy & Paste sparkle dust as a new layer, resize 60%. Now you can resize if you'd like. Add copyright info and text and you're done. This tutorial was written by Jenny on 6-23-2009. Resemblance to any other tutorial is purely coincidental and unintentional. I am using the artwork of Camilla Drakenborg. I am licensed through Artistic Minds Inc. Please check her site above for more licensing info. Open a new canvas 600 x 550. We'll crop down later. Copy & Paste Paper1 as a new layer, resize 75% then again 95%. Copy & Paste Paper11 as a new layer, resize 65%, free rotate 35 degrees right, resize 75% and add drop shadow. Copy & Paste Splat1 as a new layer, placing on top of Paper11, add drop shadow. Copy & Paste Mesh1 as a new layer, resize 85%, duplicate,mirror, duplicate and free roate 90 degrees left, duplicate, flip. Copy & Paste tube as a new layer, resize if needed, add drop shadow, place below all mesh layers. Copy & Paste heartchain2 as a new layer, resize 75%, free rotate 35 degrees left, add drop shadow. See my tag for placement. Copy & Paste wordart of choice, resize to your liking, place in the top right corner, select all, float, defloat, modify, expand 3, new raster layer, flood fill with the silver color of the Paper11, move below wordart, select none, add drop shadow. Copy & Paste bunched ribbon 3 as a new layer, resize 65%, add drop shadow, place below wordart. Copy & Paste folded ribbon 3 as a new layer, resize 90%, add drop shadow, place toward the bottom of the canvas. Copy & Paste layered flower 3 as a new layer, resize 50%, add drop shadow, see my tag for placement. Copy & Paste layered flower1 as a new lyaer, resize 50% then again 75%, add drop shadow, see my tag for placement. Copy & Paste candle3 as a new layer, resize 50% and then again 85%, add drop shadow, see my tag for placement. Copy & Paste candle1 as a new layer, resize 50% and then again by 65%, add drop shadow and place next to candle3. 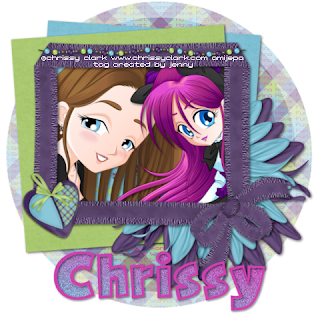 Copy & Paste Charm2 as a new layer, resize to your liking and place between the candles. Crop or resize the tag to your liking. Add copyright info and text and you're done. This tutorial was written by Jenny on 6-22-2009. Resemblance to any other tutorial is purely coincidental and unintentional. I am using the artwork of Carmen Keys. You need a license from MPT to use this artwork. Open tag template, close credits layer, shift d to duplicate, close the original. On the Top Thin Slats layer, select all, float, defloat, copy & paste Paper8 as a new layer, resize 85%, selections,invert,delete,select none,close original layer. On the Bottom Thin Slats layer, select all, float, defloat, copy & paste Paper9 as a new layer, resize 85%, selections,invert,delete, select none, close original layer. Select Circle layer with magic wand, copy & paste Paper4 as a new layer, resize 50%, selections, invert,delete, select none, close original layer. Copy & Paste your tube as a new layer, placing above the circle layer, resize if needed, add drop shadow. Select Middle Square with magic wand, copy & paste Paper6 as a new layer, resize 50%, selections,invert,delete,select none,close original layer. Select Bottom Square with magic wand, copy & paste Paper11 as a new layer,resize 50%,selections,invert,delete,select none,close original layer. Select Top Square with magic wand, copy & paste Paper10 as a new layer, resize 50%,selections,invert,delete,select none, close original layer. Copy & Paste Button Tree 1 as a new layer, place below tube, use the selection tool to bring parts of the tree above the frame, add drop shadow to original layer. Copy & Paste sign2 as a new layer, place inside bottom Square, resize 50%, add drop shadow. Copy & Paste Ribbon 2 as a new layer, resize 65%, mirror, place above tube layer keeping it inside the circle frame, use your eraser tool to remove any excess, you can repeat the step above to promote the bow part and raise it above the frame, add drop shadow on the original ribbon layer. Copy & Paste cider as a new layer, resize 50%, add drop shadow and see my tag for placement. Copy & Paste bow3 as a new layer, resize 50% then again by 65%, add drop shadow and see my tag for placement. Copy & Paste basket2 as a new layer, resize 65% then again 85%, place beside of the cider, add drop shadow. You can copy and paste each individual apple, resizing by 50% then again by 65% and place in the top Square. Copy & Paste Basket1 as a new layer, resize 50% then again 85%,add drop shadow and place in middle Square. Copy & Paste forgetmenots2 as a new layer, resize 50% then again by 65%, add drop shadow, mirror and see my tag for placement. Resize canvas if needed. Add copyright info and text and you're done. 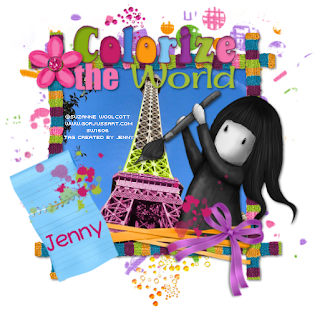 This tutorial was written by Jenny on 6-21-2009. Resemblance to any other tutorial is purely coincidental and unintentional. 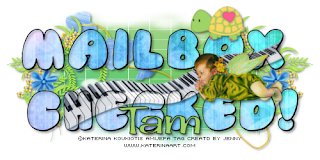 I am using the artwork of Katerina Koukiotis. I purchased this tube during AMI's BCA Promo so it is no longer available at their site but you can use any tube of your choice. I am licensed through Artistic Minds Inc. Please visit her site link above for more info on licensing. Open a new canvas 500 x 250. Flood fill white. New Raster Layer, select with magic wand, copy & paste BKG1 into selection,select none, apply mask. Using the KF Puff Font with background color set at black,size 65 no stroke, type out the name you want, this works best if you have atleast 2 words but can be done with one. Using the magic wand, select inside each letter, selections,modify, expand 1, copy & paste BKG3 as a new layer, resize 75%, selections, invert,delete on paper layer, select none, move below font and add drop shadow to the font. Do not merge! Copy & Paste clouds on string as a new layer, resize 55% and place above mask layer, add drop shadow. Copy & Paste flowers1 as a new layer, resize 65%, add drop shadow, duplicate, mirror. Copy & Paste Turtle2 as a new layer, resize to your liking and place atop one of the letters (see my tag). Copy & Paste keyboard as a new layer, resize 75%, add drop shadow, place between the font you typed out and the filling (see my tag), use the eraser to take away any excess sticking out from the letters. Copy & Paste tube of choice, resize to liking, add drop shadow and place next to the keyboard. If you want to add a name, do so now and place at the bottom of the saying. Add copyright info, merge visible and you're done. 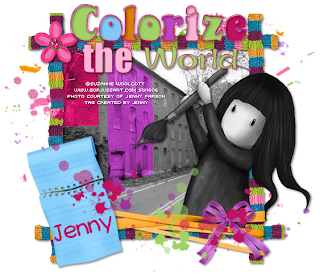 This tutorial was written by Jenny on 6-21-2009. Resemblance to any other tutorial is purely coincidental and unintentional. I am using the artwork of Suzanne Woolcott. You can purchase her tubes HERE. Please do not use the same tube without having a proper license to do so. Open a new canvas 600 x 500 and flood fill white. We'll resize later. New raster layer, select with magic wand, copy & paste Paper14 into selection, select none, move below background layer, select background layer, apply mask. Copy & Paste frame as a new layer, add drop shadow. Open photo and greyscale it. Copy & Paste Photo of choice onto canvas. Place photo below frame, resize if needed. Copy & Paste tube of choice, place below frame, resize if needed, add drop shadow. Copy & Paste Journal2 as a new layer, resize 50%, add drop shadow, free rotate right 15 degrees and place ontop of the frame left side. Copy & Paste Ribbon5 onto the frame, resize 95%, add drop shadow. Copy & Paste bow4 as a new layer, resize 65%, add drop shadow and place on Ribbon5. Copy & Paste flower of choice, resize to your liking,add drop shadow, place in upper left corner of frame. (foreground matching colors from the scrapkit), paint on the photo, it doesn't have to be perfect. If you have some paint Splatters in your brush section you can add splats of paint using different colors. Type out the saying you want to appear at the top of your tag. Add the name on the Journal. Resize or crop the tag down if you'd like. Add copyright info and you are done. This is the first tag I created with this idea. That photo actually inspired this tutorial. 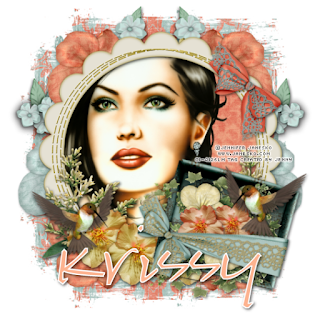 The photo was part of a challenge at the Just Gorjuss forum and is by a wonderful lady named Kristie. I loved how my creation turned out so thought I would tut it. 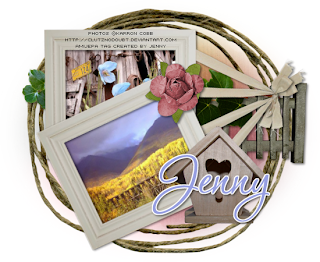 This tutorial was written by Jenny on 6-21-2009. Resemblance to any other tutorial is purely coincidental and unintentional. I am using the artwork of Irene Shpak. You need a license to use this artwork. I have a license through MyPSPTubes. Please check her site above for more licensing info. Open a new canvas 600 x 600. Flood fill white. We'll crop down later. Copy & Paste Mat6 as a new layer, resize 75%, add drop shadow. Copy & Paste bracket2 as a new layer, resize 65%. Copy & Paste paper22 as a new layer, resize 65%, select inside the bracket2 layer with the magic wand, selections, modify, expand 4, selections,invert,delete on the paper layer, select none. Copy & Paste tube or image of choice, resize if needed,move below bracket2 and repeat the step above on the tube or image layer, add drop shadow to bracket and tube afterward. Copy & Paste flower8 as a new layer, place above the mat layer and to the upper left, add drop shadow, resize 55%. Copy & Paste flower7 as a new layer, place above the mat layer and to the lower right, add drop shadow, resize 55%. Copy & Paste frame 7 as a new layer, above all other layers, resize 75%, add drop shadow, free rotate 25 degrees right. Copy & Paste frame2 as a new layer, add drop shadow, resize 90%, free rotate 25 degrees left. Copy & Paste string6 as a new layer, resize 65%, add drop shadow, place above bracket layer and toward the bottom. Copy & Paste cluster as a new layer, place to the left of the canvas, resize 65%, add drop shadow. Copy & Paste heart3 as a new layer, resize 50% then again 75%, add drop shadow,free rotate 25 degrees right and place at the top right corner of the bracket. Copy & Paste paperclip6 as a new layer, resize 50%,add drop shadow, and place above heart. Copy & Paste string3 as a new layer,resize to 75% and place to the right of the canvas, add drop shadow. At this point I hid my white background layer, cropped the tag down, added copyright info and text and saved as a PNG. This tutorial was written by Jenny on 6-20-2009. Resemblance to any other tutorial is purely coincidental and unintentional. I am using the artwork of Chrissy Clark. You need a license to use her artwork. I am licensed through Artistic Minds Inc.
Open a new canvas 600 x 600 and flood fill white. We'll resize later. New Raster layer, select with magic wand, copy & paste Paper10 into selections, select none, apply mask. Open Frame Blue, rotate 90 degrees clockwise, copy & paste onto canvas, resize 75%, add drop shadow. Copy & Paste Paper1 as a new layer, move below frame, resize 65%, use the selection tool to get rid of excess paper. Copy & Paste Swag of choice as a new layer, place toward the top of the frame, resize 65%, add drop shadow. Copy & Paste firework glitter-red as a new layer, resize 55%, add drop shadow, place above frame and toward the right middle of the frame. Copy & Paste 4 balloons of choice as new layers, resize 50%, add drop shadow, arrange together toward top right of the frame. 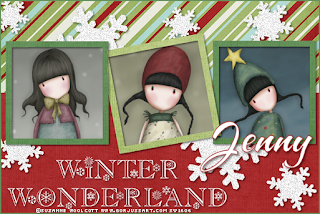 Copy & Paste doodle glitter white as a new layer, resize 85%, place below frame and above mask, add drop shadow. Copy & Paste flower of choice, place below frame at top left corner,resize to your liking, add drop shadow, duplicate,image,mirror,flip. Repeat the same step above using a swirl of choice. Copy & Paste flag1 as a new layer, resize 65%, add drop shadow, place to the left bottom of the frame. Copy & Paste tube of choice, place it upon the flag, resize if needed, add drop shadow. Resize your canvas if you'd like. I resized by 85%. This tutorial was written by Jenny on 6-17-2009. Resemblance to any other tutorial is purely coincidental and unintentional. I am using the artwork of Chrissy Clark. You need a license to use her work. I have a license through Artistic Minds Inc. Type out a phrase using a small font such as AddWBitmap09, center, convert to raster, effects, plugin, MuRa Meister Copies. Select the mask layer with the magic wand, selections,invert, delete on text layer, select none. Copy & Paste frame3 as a new layer, resize 75%. Copy & Paste Paper5 as a new layer, move below frame, resize 50%, use selection tool to get rid of any excess. Copy & Paste first tube of choice as a new layer, resize if needed, place below frame, shadow tube and place to the right of the frame. Copy & Paste 2nd tube as a new layer, repeast above and mirror. Add drop shadow to the frame. Copy & Paste Paper 4 as a new layer, resize 50%, free rotate 4 degrees right, add drop shadow and place paper below frame and paper. Copy & Paste Paper 2 as a new layer, resize 50%, free rotate 4 degrees left, add drop shadow and place above Paper4. Copy & Paste heart as a new layer, resize 50% and more if needed, add drop shadow, mirror and place to the left of the frame. Copy & Paste flower6 as a new layer, resize 65%, place below frame, add drop shadow. Copy & Paste flower5 as a new layer, resize 65%, place below flower6 and pull down just a bit, add drop shadow. Copy & Paste beadchain, resize and place on the frame. Resize your canvas if needed. Add copyright info. Now for your name, I used 0ToonBlockDNA with a dark color from my tube, select inside each letter with the magic wand, modify, expand 1, new raster layer, flood fill with a gradient made from color of the canvas, select none, move below, add drop shadow to the font. Then I applied dsb flux noise at 27 mix to the filling of the text. This tutorial was written by Jenny on 6-16-2009. Resemblance to any other tutorial is purely coincidental and unintentional. I am using the artwork of Zindy Zone. You need a license to use her work and can check out her store HERE. However, this image is a FTU image and can be downloaded HERE. Please read and follow her TOU. Open a new canvas 600 x 600. We'll resize later. Flood fill white. Copy & Paste Paper14 as a new layer, resize 70%. Copy & Paste Paper7 as a new layer, resize 70%, free rotate right 8 degrees, resize again 90%. Copy & Paste Paper12 as a new layer, resize 70% then again by 90%. Copy & Paste Frame5 as a new layer, resize 75%, Copy & Paste Paper9 as a new layer, resize 50% and move below the frame, Copy & Paste the tube as a new layer, resize to 80%, move below frame and above the paper, add drop shadow to tube, using the magic wand select inside the frame, selections,modify, expand 4, selections,invert, delete on the tube layer and the paper layer, select none, add drop shadow to the frame, merge frame,tube and paper together, move the framed image over toward the right a bit, see my tag. Copy & Paste cloud as a new layer, move below frame and toward the right. Copy & Paste Moon as a new layer, resize 50%, add drop shadow and place above the cloud layer. Duplicate the cloud layer and move above the moon layer. Copy & Paste Tree2 as a new layer, add drop shadow, place to the left of the frame. Copy & Paste Fallen Log2 as a new layer, resize 65%, add drop shadow and see my tag for placement. Copy & Paste wolf (s) of choice, resize to your liking and place to the right bottom of the frame by the Fallen Log layer, add drop shadow to each. Copy & Paste grass2 as a new layer, place infront of the Fallen Log, resize to your liking, add drop shadow. Copy & Paste Clear Paw Print as a new layer, resize to your liking and place in the top left corner of your canvas. See my tag. Now for the Phrase....I used Be Safe for most of it and Twilight for "Big Dogs" and "Bit"
Convert text to Raster Layer, selections, select all, float, defloat, modify, expand 2, new raster layer, flood fill white, move below text, select none, add drop shadow. Resize Canvas if you would like. Merge visible. Add copyright info and you're done. This tutorial was written by Jenny on 6-16-2009. Resemblance to any other tutorial is purely coincidental and unintentional. I am using the artwork of Chrissy Clark. You need a license to use her artwork. I have a license through Artistic Minds Inc.
Christmas in July is just around the corner so I'm in the mood to write some Christmas tuts! Open a new canvas 600 x 600 we'll resize later. Flood fill white. New Raster Layer, select with magic wand, copy & paste Paper13 into selection, select none, apply mask. Using a color from your tube and the change to target brush tool, recolor Paper13. Copy & Paste Frame 4 as a new layer, resize 85%, add drop shadow. Copy & Paste Paper11 as a new layer, resize 50%, again recolor using a color from your tube and the change to target brush tool. Copy & Paste bow of choice, recolor same as above, resize to your liking, place in top left corner of the frame and free rotate left 15 degrees, add a drop shadow. Copy & Paste tube of choice, resize if needed, add drop shadow, place in the center of the frame on the outside. 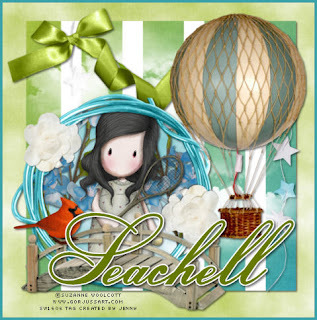 Copy & Paste Bauble of choice, recolor, resize to your liking and place in your tubes hand if possible, add drop shadow. Copy & Paste Tree and place to the right of the frame on the outside, recolor to match the rest of your tag, add drop shadow. Duplicate the Bauble that you placed earlier, place on the tree, duplicate again and arrange to your liking. Copy & Paste bow of choice, recolor, resize small to your liking, add drop shadow and place on the tree, duplicate and arrange to your liking on the tree. Copy & Paste presents as a new layer, recolor each, duplicate if you'd like, resize to your liking, add drop shadow and place under tree. OPTIONAL: Copy & Place Flower2 as a new layer, add drop shadow, effects, plugins, MuRa's Meister Copies, encircle, ok, move below frame and above mask layer. Resize your canvas if you'd like. Add copyright info and text and you're done. This tutorial was written by Jenny on 6-14-2009. Resemblance to any other tutorial is purely coincidental and unintentional. I am using artwork ©Jennifer Janesko. In order to use the image in this tutorial you MUST purchase it from C.I.L.M. The image I am using is for example ONLY. Anyone wishing to use the same image MUST purchase it from C.I.L.M. and have proper license from C.I.L.M. for the usage of that tube/image. 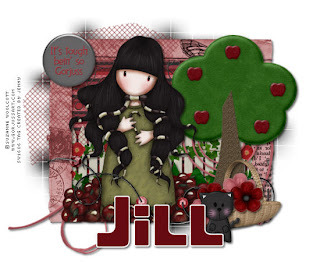 Please check her site above for more licensing info as this artist is no longer licensed with CILM due to the closing. New Raster Layer, select with magic wand, copy & paste Paper 5 into selection,select none and apply mask. Copy & Paste Frame 1 as a new layer, resize 60% add drop shadow. Copy & Paste Paper 1 as a new layer, resize 50%, move below frame, use eraser tool to get rid of excess paper. Copy & Paste tube of choice, move below frame, resize if needed and add drop shadow. Copy & Paste hummingbird as a new layer, resize 50%, add drop shadow, place to your liking, duplicate,mirror. Copy & Paste Branch2 as a new layer, move above mask layer, add drop shadow, duplicate,mirror. Copy & Paste flower1 as a new layer, move above Branch2 layer, resize 50%,add drop shadow, duplicate, mirror, duplicate, flip, duplicate, mirror. Copy & Paste Flower2 as a new layer, resize 50%, add drop shadow, place above Flower1 layer and to the left, duplicate, mirror. Copy & Paste Bow1 as a new layer, resize 50%, add drop shadow, place on the right of the frame. Copy & Paste Keepsake Box1 as a new layer, resize to your liking, move below one of the hummingbirds, add drop shadow, free rotate right 15 degrees. Copy & Paste wrap 2 as a new layer, resize to fit on the Box, rotate right 15 degrees right, add drop shadow. Copy & Paste Flower3 as a new layer, resize 50% twice, place in box. Continue to do this with any of the accessories that you'd like until the box is filled to your liking. Add a drop shadow to each. See my tag. Now you're going to need to select your mask layer, pull it down just a bit, duplicate, flip. Resize the tag if you'd like. Add copyright info and you're done. This tutorial was written by Jenny on 6-14-2009. Resemblance to any other tutorial is purely coincidental and unintentional. I am using the artwork of Amanda Fontaine. You need a license to use her artwork. I'm licensed to her art at Artistic Minds Inc. You can now purchase her tubes HERE. Open a new canvas 600 x 600 (resize later) flood fill white. New raster layer, select with magic wand, copy & paste Paper6 into selection, select none, apply mask. Copy & Paste Element23 as a new layer, resize 65%, add drop shadow. Copy & Paste Paper10 as a new layer, move below frame, resize 65%, use selection tool to remove excess paper. Copy & Paste Element14 as a new layer, resize 65%, add drop shadow,move below frame, use selection tool to remove excess. Copy & Paste Element6 as a new layer, resize 50%, place in the right top corner of the frame. Copy & Paste balloons as a new layer, arranging them each to your liking and place in the right corner above the frame, add drop shadow to each, resize 65%, placing above Element6. Copy & Paste flag of choice as a new layer, resize if needed, add drop shadow, see my tag for placement. Copy & Paste tube as a new layer, resize if needed, add drop shadow, place above frame and to your liking. Now you can copy & paste flowers and stars as you like resize and arrange to your liking placing in the bottom left corner of the frame, add drop shadow to the flowers and not on the stars. Resize canvas if you'd like. Add copyright info and text and you're done. This tutorial was written by Jenny on 6-14-2009. Resemblance to any other tutorial is coincidental and unintentional. I am using the artwork of Suzanne Woolcott. You need a license to use her artwork. You can view and purchase her artwork HERE. Open a new canvas 600 x 600 (resize later). Flood fill white, new raster layer, select with magic wand, copy & paste pp02 into selection, select none, apply mask. Copy & Paste frame-03 as a new layer, resize 75%. Copy & Paste pp09 as a new layer, move below frame, copy & paste waves as a new layer, resize 50%, add drop shadow, move below frame and toward the bottom, duplicate,move up a bit and below the first waves, Copy & Paste tube as a new layer, move below frame and above waves, resize if needed, use the magic wand and select inside the frame, selections,modify, expand 4, selections,invert,delete on the paper layer, click delete on the tube layer and on both waves layers,select none, add drop shadow to the frame and the tube. Copy & Paste bubble cluster as a new layer, resize 50%, move between the two waves layers, see my tag. Copy & Paste no fishing sign as a new layer, place on frame to the right, resize 50% then again 65%, add drop shadow. 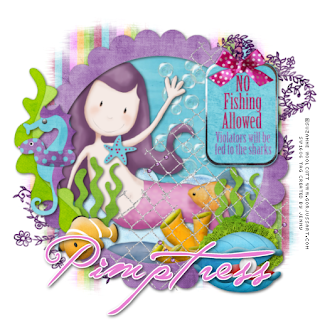 Copy & Paste glitter back splash as a new layer, resize 65%, move below no fishing sign. Copy & Paste bow 01 as a new layer, resize 50% then again 65% and place at the top of the sign. Copy & Paste fish 01 as a new layer, resize 50% then again 65%,add drop shadow and move toward bottom left of the frame. Copy & Paste purple seaweed as a new layer, resize 80%, move above mask layer. Open sea grass and using your selection tool select a piece of the sea grass, copy & paste it onto canvas, resize 50% then again by 65%, add drop shadow, duplicate and place both to your liking inside the frame. Copy & Paste shell as a new layer, resize 50% then again 75%, add drop shadow and place to the bottom right of the frame. Copy & Paste sea foam as a new layer, resize 50% twice and move below shell, add drop shadow. Copy & Paste seaweed2 as a new layer, resize 50% then again 75%, mirror, add drop shadow, free rotate 10 degrees right place on the left of the frame. Copy & Paste seahorse as a new layer, resize 50% then again 65%, add drop shadow and place on the frame above the seaweed2. Now is the time to resize if you'd like. Add copyright info and text and you're done. This tutorial was written by Jenny on 6-12-2009. Resemblance to any other tutorial is purely coincidental and unintentional. I am using artwork ©Gennadiy Koufay. I'm licensed to this image through C.I.L.M. The image I am using is for example ONLY. This tube is Courtesy of C.I.L.M. Special Bonus/Promotional Tube (Part of the Christmas '08 Gift), not available for purchase. Open template, new raster layer, flood fill white, move to bottom. Select Shape 3 & Shape 4 with your magic wand, copy & paste bkg10 as a new layer, resize 75%, selections,invert,delete,select none, hide original layers. Select Shape 1 with your magic wand, copy & paste bkg6 as a new layer, resize 75%, selections,invert,delete,select none,hide original layer. Select Shape 2 with your magic wand, copy & paste bkg20 as a new layer, resize 65%, selections,invert,delete,select none, hide original layer. Select Shape 2 Copy 1 with your magic wand, copy & paste bkg12 as a new layer, resize 65%, selections,invert,delete,select none, hide original layer. Select Shape 2 Copy 2 with your magic wand, copy & paste bkg13 as a new layer, resize 65%, selections,invert,delete,select none, hide original layer. Now if you're using MuRa's Meister Copies, select a flower of choice, copy & paste as a new layer onto the canvas, resize 65%, add drop shadow, apply MuRa's Meister Copies Encircle, move below Shape layers, see my tag. Copy & Paste sign2 as a new layer, move to the top left corner of the canvas, resize to your liking, add drop shadow. Copy & Paste wrap1 as a new layer, add drop shadow, resize 50%, mirror, and see my tag for placement. Also add a button and place to your liking. Copy & Paste tube of choice as a new layer, resize if needed, add drop shadow, see my tag for placement. Copy & Paste musical notes as a new layer, resize 75%, add drop shadow, place below tube layer. Copy & Paste jukebox as a new layer, add drop shadow, resize if needed, place below musical notes layer. See my tag. Copy & Paste Counter2 as a new layer, resize 65%, add drop shadow, see my tag for placement. Resize now if you'd like. Add copyright info and text and you're done. I have Unofficial Always List in several groups as well as Official ones. It has become a henderance because some of the groups are exclusive groups allowing only certain artists, so, I've decided to make it easier on me. I have opened a yahoo group for my AL. Feel free to sign up by joining HERE. The only emails you receive are when I send out a notice letting you know there is a new tag. I link you to my PB account for pick up and you can either respond to me or post a comment on each tag you pick up. Whichever is easier for you. Please don't sign up unless you plan on saving your tags. 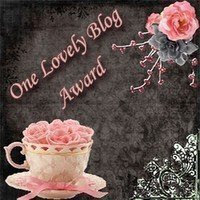 I received this award from Soxsational Scraps. Thanks sweetie I appreciate it bunches. I'm suppose to pass this along to 7 others but I'm going to hold off for now as I have the feel bad yuckies. Be sure to check out Sox's blog by clicking the link above and check her out over at Twilight Scraps too. This tutorial was written by Jenny on 6-8-2009. Resemblance to any other tutorial is purely coincidental and unintentional. I am using the artwork of Suzanne Woolcott. You need a license to use her artwork. You can purchase her artwork HERE. Open a new canvas 550 x 450. Flood fill white. New Raster Layer, select with magic wand, copy & paste paperi into selection, select none, apply mask. Copy & Paste frame6 as a new layer, resize 65%,add drop shadow. Copy & Paste paperj as a new layer, move below frame, resize 50%, use selection tool to get rid of any excess sticking out from the frame. Copy & Paste fence as a new layer, place between frame and paper, use selection tool to remove any excess, even resize a bit if needed, add drop shadow. Copy & Paste grass as a new layer, place ontop of fence toward bottom, again use selection tool to remove any excess, add drop shadow. Copy & Paste tree with apples as a new layer, resize 55%, add drop shadow, place above frame layer and to the left. Copy & Paste string as a new layer, resize 60%, add drop shadow, move below tree layer. 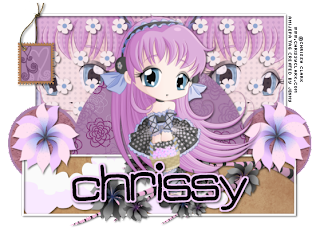 Copy & Paste mesh, resize to your liking and see my tag for placement. Copy & Paste button of choice, resize if needed, add drop shadow and place above mesh. Copy & Paste tube of choice,resize if needed, add drop shadow and see my tag for placement. Copy & Paste sequinstring as a new layer, resize 60%, see my tag, add drop shadow to this layer. Copy & Paste basket as a new layer, place infront of tree, resize to your liking, add drop shadow. Copy & Paste flowers of choice, duplicating and resizing (50% twice then 65%) and place them in the basket. Copy & Paste cat, resize, add drop shadow and place to your liking. Resize the canvas if you'd like. Add copyright info and text and you are done. This tutorial was written by Jenny on 6-7-2009. Resemblance to any other tutorial is purely coincidental and unintentional. I am using the Photography of Lacy Clagg. 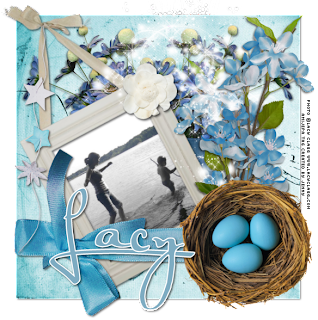 You need a license to use Lacy's artwork/photography. I'm licensed to this image through Artistic Minds Inc. Copy & Paste Paper5 as a new layer, resize 65%, add drop shadow. Copy & Paste element43 as a new layer, resize 65%, add drop shadow. Copy & Paste Photo of choice, move below frame layer, resize if needed, merge frame and photo together, free rotate 28 degrees left. Copy & Paste Element16 as a new layer, resize 55%,add drop shadow, place close to the frame on the right side, duplicate,mirror and move over more to the right. Copy & Paste Element41 as a new layer, move below frame, resize 55%, add drop shadow, duplicate and move over to the left a bit. Copy Element75 as a new layer, resize 65%, move between the flower layers. see my tag. Copy & Paste Element67 as a new layer, resize 50% and then again 65%, add drop shadow, move to the right of the canvas. see my tag. Copy & Paste Element12 as a new layer, resize 50%, add drop shadow, flip and see my tag for placement. Copy & Paste Element27 as a new layer, resize 60%, add drop shadow, adorn the frame. Copy & Paste Element1 as a new layer, resize to your liking. see my tag for placement. Resize the canvas if you'd like. Add copyright info and text. Hide the white background layer, save as PNG. You're done! 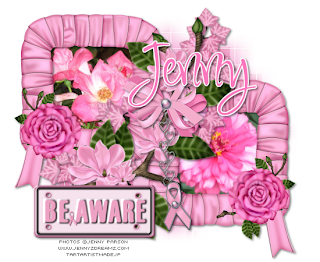 Below is another example using the same kit and the artwork of Suzanne Woolcott. You can purchase her artwork HERE. This tutorial was written by Jenny on 6-3-2009. Resemblance to any other tutorial is purely coincidental and unintentional. 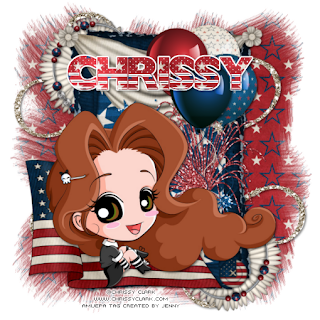 I am using the artwork of Chrissy Clark. You need a license to use her work. I have a license through Artistic Minds Inc.
Open Misfit Template. We'll resize it later. Close the credit layer, shift D to duplicate,close original. Select the purple square with your magic wand. Copy & Paste Paper11 as a new layer, selections,invert,delete,select none. Copy & Paste close up tube as a new layer, resize if needed, add drop shadow, drop the opacity to 70 or so, duplicate,image,mirror, select the purple square again with the magic wand, selections,invert,hit delete on both the close up tube layers,select none. If you're using the same tube or have something similar you can copy & paste the flowers as a new layer, resize to 75%,add drop shadow and repeat the same step above with the magic wand, hide original purple square. Add drop shadow to the frame layer. Select circle1left with magic wand, copy & paste paper of choice as a new layer, resize to 50%,selections,invert,delete,select none, add drop shadow, duplicate,mirror, close circle1left and circle1right original layers. Select circle2left with magic wand, repeat the same step above. Select white half circle with magic wand, copy & paste Paper15 as a new layer, selections,invert,delete,select none, hide original layer. Select black rectangle with magic wand, copy & paste Paper10 as a new layer, selections,invert,delete,select none. Add drop shadow to the frame, hide the original black rectangle layer. Copy & Paste cloud as a new layer, placing below the frame but above the new black rectangle layer, add drop shadow. Copy & Paste tube, resize if needed, add drop shadow. Copy & Paste flowers and any other embellishments you want to add as new layers,resize each if needed, add drop shadow and place to your liking. If you want a white background then you'll need to add a new raster layer,flood fill white and move to the bottom. Resize the canvas if you'd like. I resized mine by 85%.